The climate of the Galapagos Islands varies between the seasons and also across the different areas of the islands such as the coastal areas and the higher elevations. The cooling effect of the Humboldt Current means that the climate across the Islands is generally mild and dry. Between May and December the winds blow from south-easterly direction so the coastline of the southern islands receive a supply of cool water, which chills the air and creates relatively cold conditions for islands that are located close to the equator. During this period there is little rain in the coastal regions, which means that the only plants that can survive here are those that can survive a long time without water (for example lichens and cacti). However, wherever the Islands become higher, clouds provide moisture which can lead to a much higher biodiversity of plant life. 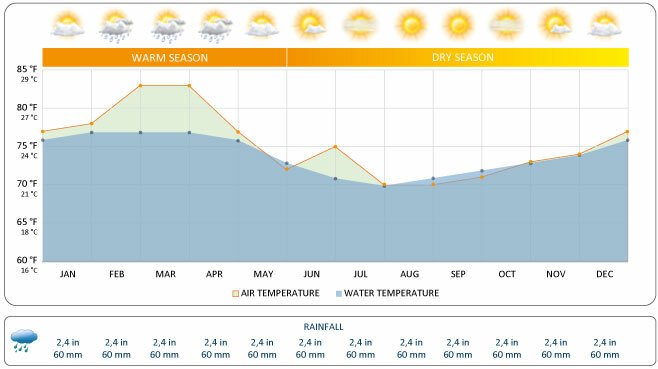 January to April is considered the rainy season and this bring with it reduced winds and much warmer sea currents. There is often heavy rain at higher elevations which causes streams of water to flow downhill, providing water to a much wider range of flora and fauna.